We are living in tough times at the moment and van break ins are rife across the UK and beyond. The criminals are willing to risk more and more to steal your hard earned tools or your freight; so you need to take your vehicle security more seriously now than ever before. 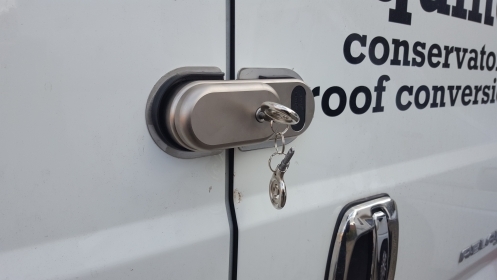 The Ultimate Van Lock is available as either a Slamlock or as a Deadlock and can be fitted to the load area doors of most current model vans. We may have high and low lock positions for the side load door and rear barn doors, so the position may vary from those pictured. If you have a specific preference then please specify this at the time of placing the order as all kits are made specifically to order and parts for the low down position will not work for the high position and vice versa. Please also let us know if you have any glass in the side or rear doors as the high position locks are often not compatible when there is a window in the panel. The key is a security dimple type key to make it difficult to be lock picked, and the lock itself is a large, bold, statement type lock to let a would be thief know you mean business.